Instructions: All players are dribbling a soccer ball in a the designated area with the exception of at least 2 players. The 2 players hold hands or lock arms to create a snake. 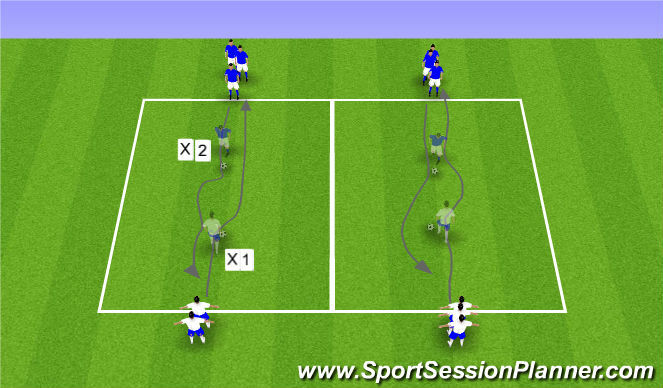 The Snake works together to tag the dribbling players who then become a part of the snake. The snake must try to stay connected and not break into little parts. Coach, encourage the snake to make hissing noise like a snake. Set Up: 30 x 20 field with 2 end zones at each end of 5yards (See Diagram)). Instructions: Place half of the balls in each end zone. Each team selects 2 players to be the defenders. Team line up on opposite sides of the field and the defenders position themselves between the 2 end zones(See Diagram). On the coaches command the teams run across to the opposite end zone, pick a ball and attempt to carry the ball back to their end zone without being tagged by the defenders. If tagged the ball is replaced and they must try again. The team with the most balls in there end zone after a set time is the winner. 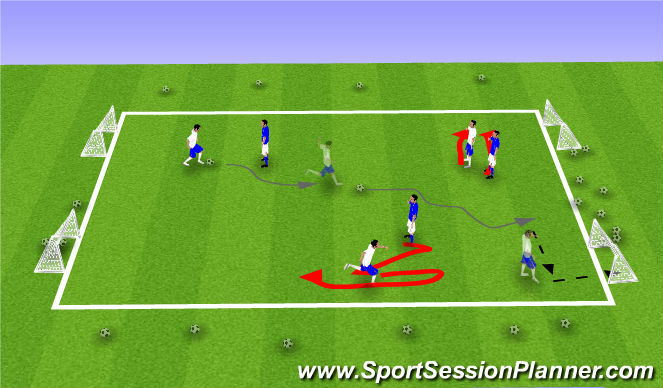 Progressions: Players now have to dribble the ball across, defenders must also dribble a ball. Players must dribble the ball past the defender who are now attempt to touch the ball with their feet. - Double points for 3 sided team and half points for team of 4 – first to 4 wins. - Team of 4 can score in either goal and team of 3 must defend for 2 minutes. Rotate players in each team to ensure all get a go a both tasks. - Movement off the ball to create space/ Try something new, be confident – make space for the shot then get your shots of quickly. - Loads of goals….loads of FUN! !